Oh, God, just when I was thinking of ending it all (Christmas really messes me up the most) along comes a reason to live: in September, TCM will air the 1956 Katharine Hepburn/Bob Hope movie “The Iron Petticoat.” And not the butchered 83-minute version but one with 12 minutes restored. 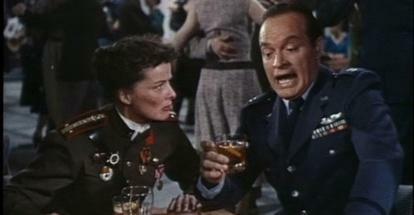 In the picture, Hope plays a U.S. major and Hepburn a Soviet Communist pilot. Kate the Commie! I love it, even though the actress didn’t. In an interview with biographer Charlotte Chandler, Hepburn complained that Hope’s jokes “overwhelmed my character. I didn’t care. I wish he would have overwhelmed me right out of the film.” Kate could never have been a diplomat.